Dareechah-e-Nigaarish - What's New this month? A Case of Exploding Mangoes"
embedded music video links to Dareechah's YouTube channel "Goonj"
Uploaded a new poem to my web page "Poems by Talat Afroze"
Fuzon Band's Song from the album "Saagar"
Milestones song from their album "Jaadoo"
Posted my latest Punjabi poem to my page "Ikk Jhallee"
کبھی ہم خوبصورت تھے as a tribute to the memory of teenage Pakistani students massacred by a Taliban attack on 16th December, 2014 at Army Public School, Peshawar, Pakistan. 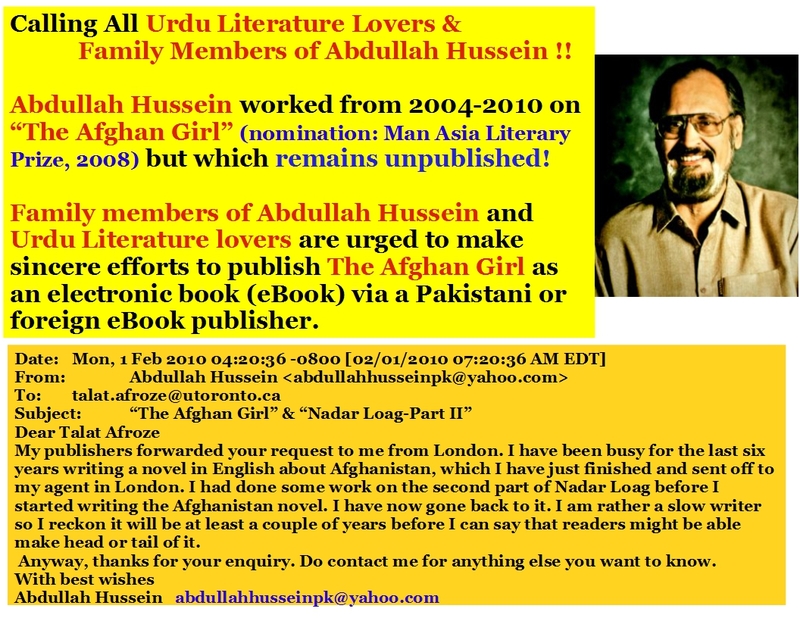 Created a brand new web section on Dareechah for guiding high school, college and university students in Pakistan about how to create an Urdu electronic book or Urdu eBook which may be read on either Amazon's Kindle eReader or the Icarus eReader. Updated info about where to buy the latest version of InPage 3.51 Urdu word processing software which now offers the ability to export Urdu text as .rtf (Rich Text file format) or .html (hypertext) file format. C﻿reated a new Urdu Fiction Writers page dedicated to the TV plays written and directed by Lahore's Shahid Mahmood Nadeem. Zard Doe-pehar is a Pakistan Television Corporation play written and directed by Shahid Mahmood Nadeem. It was broadcast originally in 1995 and recounts how the serving as well as retired Generals of Pakistan Army's spy agency Inter Services Intelligence or ISI create "political leaders" (puppet leaders who are manipulated all the time by the Pakistan Army and the Pakistani Establishment) by recruiting from the upper middle class of Pakistan. These puppet leaders are lured by promises of wealth and power. Created a web page for the Bengali Art Film Antareen (The Confined) by Bengali Film Director Mrinal Sen and posted dialogues in Urdu of a key scene in the movie. Uploaded 5 ghazal videos to Munir Niazi: Ghazal Videos page in Dareechah and three song videos to Munir Niazi: Song Videos. Uploaded my second ghazal to my web page "Poems by Talat Afroze"
Created a new entry for the Indian Art Film "Maya Mem Saab" based on Gustave Flaubert's epic novel "Madame Bovary" on Dareechah's web page "Indian Art Films". Developed a new web page dedicated to Qamar Yoorish (1932-2007), an Urdu short story writer who only recieved a school education upto Grade-2 and was committed to the Pakistan Labour Movement and to the establishment of a classless democratic society in Pakistan. 4. Ab Kay Tajdeed e Wafa Kaa NaheeN ImkaaN JaanaaN ! 5. BarsoN Kay Baad Daykkhaa Ik Shakhs Dil Rubaa Saa ! Created a Punjabi Folk Songs page as an Audio Gallery showcasing downloadable mp3 files of some mesmerizing Punjabi Folk Songs. My first choice was a folk song sung by Musarrat Nazir "Jogee Uttar PahaarroN Aayaa!" Created an Audio Gallery of selected Shah Husain Punjabi Kafis. This 16th Century Classical Punjabi Poet influenced the diction of many modern Punjabi poets. I revamped the Dareechah Home Page with a large photograph of Mohtaram Majeed Amjad on his 100th Birth Anniversary (29th June, 2014). He is decidedly among the top 5 modern Urdu poets. He and Munir Niazi, Sarmad Sehbai, Fahmida Riaz were among the chief inspirations for me when I started writing poems in my college days (1976; Forman Christian College University, Lahore). Uploaded two new poems by Majeed Amjad to the Majeed Amjad Poems page on his 100th Birth Anniversary. 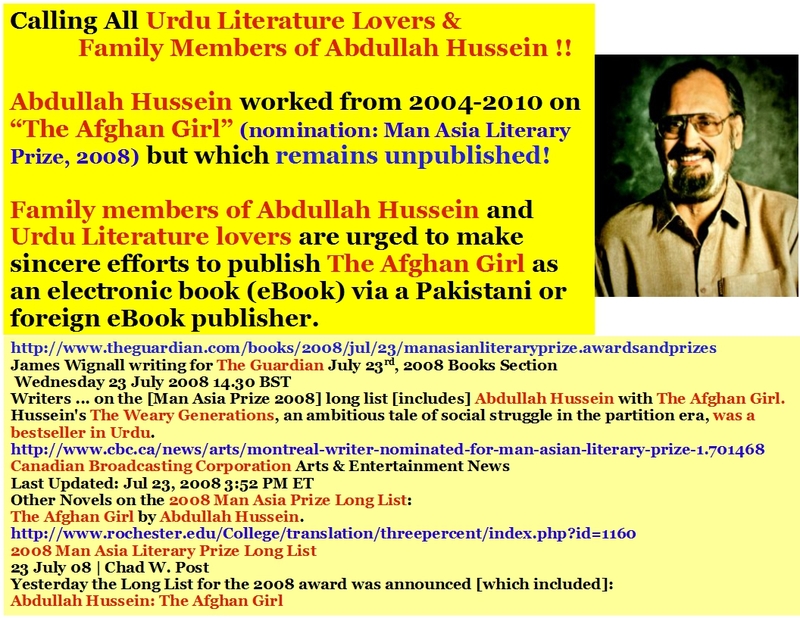 I have also created three new web pages dedicated to the poetry, critique of craft and music videos of a brilliant modern Urdu poet from Pakistan, Mohtaram Saifuddin Saif. Uploaded my first Urdu ghazal and two of my poems to the Dareechah web page "Poems by Talat Afroze"
and have also uploaded the Amjad Islam Amjad song : جو بھی کچھ ہے to the Modern Urdu Songs page. which I had written just that day to the Poems by Talat Afroze page within Dareechah. Gulzar's song in Art Film Raincoat as a music video on Gulzar: Song Videos page. Uploaded a moving Urdu poem describing the legendary Saadat Hasan Manto, the great short story writer, written by Majeed Amjad and entitled "Manto"... my facebook post showing the image of this poem got 49 shares ... click on "Manto" to read this Majeed Amjad masterpiece ! Five Urdu songs by the Urdu song writer Bharat Vyas who originally hailed from Rajasthan. A new web page describing the contribution by Dr. Rasheed Jahan, a medical doctor and Urdu short story writer and Urdu playwright (literary mentor of Ismat Chughtai), who alongwith a few other writers (such as Sajjad Zaheer) launched the famous Progressive Writers' Movement. "Yeh dil jo mayraa hotaa". The film is available on YouTube but YouTube is banned within Pakistan and Pakistanis cannot watch any of YouTube's fabulous content online. Added URL links on Dareechah's Indian Art Films web page for watching two of Satyajit Ray's Art Films on YouTube viz. Apur Sansaar(The World of Apu) 1959. 2. Started a New Section entitled "New Voices !!" on Dareechah which will feature young, upcoming Urdu poets whose poems I like. I added descriptions and links to watching some Art Films that I feel are important for young Pakistanis all over the world who have a talent and the desire for creating beautiful, moving, lyrical modern Urdu poetry. Mrinal Sen's "Khaarij" (Case Closed). Gautam Ghosh's "Paar" (The Crossing). Jim Jarmusch's "Stranger than Paradise". Wong Kar Wai's "Chungking Express". 1. Discovered a new modern Urdu poet hailing from Jhang and Multan Pakistan, Najmul Asghar Shahia (1945-2010) who wrote beautiful Urdu poems and elegant Urdu ghazals. 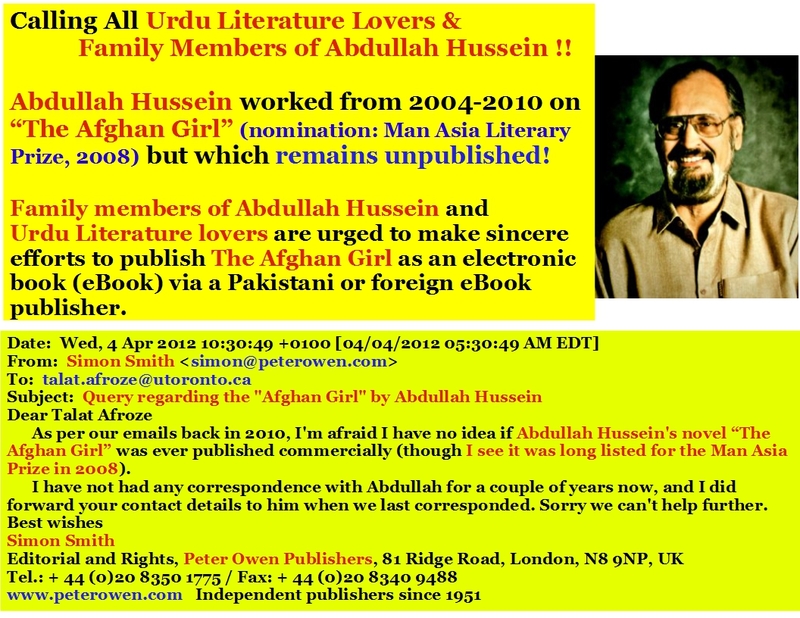 Have started a web page showcasing his Urdu poems and will start a page showing some of his Urdu ghazals as well. 2. Sang e Meel Publications has published the Collected Verse of Ahmed Shamim (1927-1982) in June, 2013 entitled کبھی ہم خوبصورت تھے and I have uploaded a poem from that collection درد کا ثمر on Dareechah's Ahmed Shamim page. Will now start a new web page showcasing Ahmed Shamim's Urdu ghazals soon. showing where to buy this software from in India, Pakistan and the UK in Dareechah's section entitled Links to Web Resources. 5. Have made some modest progress towards my goal of finding software mechanisms to create Urdu electronic books or Urdu eBooks in .Mobi and ePUB formats. 1. Uploaded my Urdu poem "Waapsee" to the Poems by Talat Afroze folder. Also uploaded this poem to my Facebook page "Talat Dareechah-Waalaa". This poem is included in my first collection of poems Ojhal Cheezain اوچھل چیزیں which can be purchased from Dareechah Baazaar. Created a web page for a little known modern Urdu poet, Fareed Javed and uploaded two of his ghazals. Posted these ghazals on my facebook page "Talat DareechahWaalaa" as well to raise awareness about Fareed Javed. 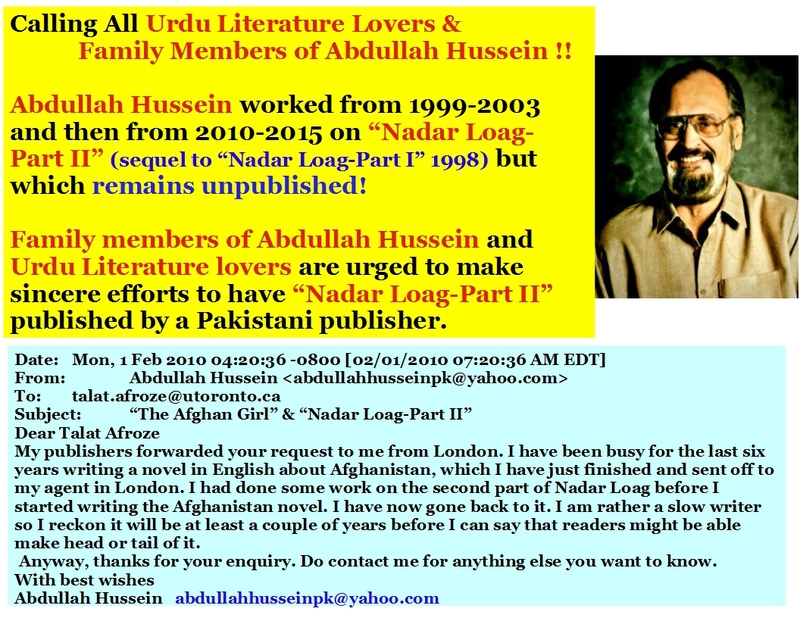 Messaged renowned poet Sarmad Sehbai, BBC journalist Amin Mughal and Fahim Jozi (Pakistani literati in UK who worked on the first collection of Majeed Amjad published after Majeed Amjad's death) to request search for ghazals by Fareed Javed. Uploaded some selected poems from my first collection of Urdu and Punjabi poems اوجھل چیزیں Ojhal Cheezain onto a new page I created in the About Us section of Dareechah. This new web page within the About Us folder of Dareechah is entitled "Poems by Talat Afroze"
My first collection of Urdu and Punjabi poems entitled اوجھل چیزیں Ojhal Cheezain was launched for sale as a paperback book at Dareechah Baazaar, the bookstore page of Dareechah e Nigaarish.